Hoffman’s Chocolates is pleased to celebrate the fall season with the launch of its fall flavors and Halloween-inspired offerings. 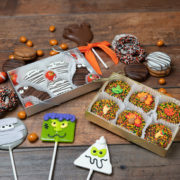 The South Florida gourmet chocolatier will offer several limited-edition treats including its Apple Cinnamon or Pumpkin Spice Truffles (5 pack), Pumpkin Spice Expresso Beans, Turkey Lollipals; and Halloween Oreo Cookies; and its classic Chocolate Haunted House. All South Florida stores will also feature gourmet fall ice cream flavors including Pumpkin, Apple Pie and Carrot Cake. Guests can have these flavors blended to create their own seasonal milkshake. Apple Cinnamon or Pumpkin Spice Truffles (5 pack) – Each exquisite truffle is a tenderly handcrafted blend of rich heavy cream and smooth silky chocolate infused with apple cinnamon or pumpkin spice flavors. Pumpkin Spice Expresso Beans – Espresso beans covered with a deliciously sweet pumpkin spice flavor blended with ground expresso, comes in a 6.5 oz bag. Ghost Pops – This spooky little treat is 1.5 oz of our amazing milk chocolate shaped like a ghost. Mummy & Ghost Cookies – Spooky and cute, all in one! The white confectionery mummy Oreo is made from a fresh Oreo® dipped in our world-class white confectionery. The milk chocolate covered ghost Nutter Butter brings together the legendary combination of peanut butter and chocolate for an amazing Halloween treat. Chocolate Haunted House made with 16 ounces of milk chocolate decorated with spooky frosting characters. Turkey Lollipals – These beautifully decorated lollipals are 5 oz of our amazing milk chocolate and a perfect treat for the little Turkeys after Thanksgiving dinner. Solid Milk Chocolate Turkey – Delicious, 6 oz. solid chocolate turkey. Fall Platters feature an assortment of Hoffman’s Chocolates gourmet chocolates including the famous Almond Butter Crunch (creamy butter roasted almonds and sugar cooked in a copper kettle then hand-cut and enrobed in luscious Hoffman’s premium chocolate and sprinkled with almonds), chewy Pecan Jitterbugs (crafted from a mixture of creamy caramel blended with fresh Georgia pecans, and enrobed with our luscious milk chocolate – this is our delectable version of that Southern classic – the Turtle) , Creams, Caramels, Nut Clusters, Marshmallows, and much more. Hoffman’s Chocolates is also excited to announce its schedule of Halloween-themed Children’s Chocolatier Classes Build-A-Chocolate Haunted House where attendees can build a chocolate house and decorate it with colorful candy toppings. The classes will take place at its Greenacres factory store, located at 5190 Lake Worth Road. During the class, young chocolatiers will have the opportunity to be creative and assemble and design their own chocolate haunted houses using icing, festive candies and confections. The 2-hour classes will take place various times throughout October. All classes include a guided window tour of the chocolate factory, a video presentation of The History of Chocolate, and a sampling of Hoffman’s gourmet ice cream. The cost to participate in these classes is $24.95 per person. Space is limited. To register a child or group, please call 561.967.2213.